We recently released the External Endpoints feature which provides a mechanism that allows your devices to connect to scriptr.io and send their data over MQTT and WebSockets. This out-of-the-box solution makes it very easy for you to start receiving device data and processing it with minimal effort. The way it works is simple. Start by configuring your endpoint by going to Settings, switching to the External Endpoints tab, then adding a configuration entry that contains the endpoint settings such as the URL, protocol and authentication parameters. Once you have an endpoint, all you still need to do is switch to the Channels tab, pick the channel that you’d like the endpoint data to be published to, then connect it to this endpoint by creating a bridge between them. Stay tuned for a new blog post on a real life implementation of the external endpoints feature. We also just released the Dashboard builder, a tool that allows you to create elegant, real-time dashboards with its intuitive drag and drop user interface. You can build dashboards to visualize the data collected from your IoT devices in minutes. You only need to pick the chart to display, drag it and drop it to your dashboard, then connect it to your data source through its simple settings dialog. 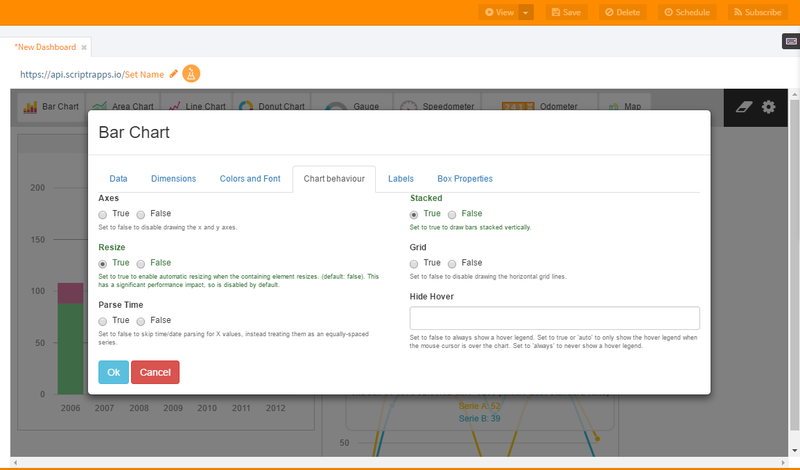 You can add as many charts as you like in a single dashboard, which is an HTML file that you can use anywhere. 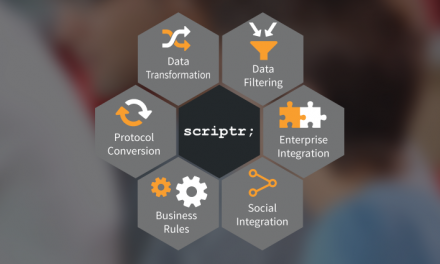 For more information about the Dashboard builder, check out our Using Scriptr.io’s Dashboard Builder blog post. Check out the documentation for all the features. You can always contact our support team with any inquiries on support@scriptr.io. Stay tuned for more news and new feature updates! May Upgrades – It’s all about time!